A big part of the reason I started this blog was to find my voice. My authentic voice. To work out, in the midst of this life, which has gone through some pretty monumental shift in the last few years, who I really am. Everything flows out of my brain in logical sequences which is crazy weird when, until that moment when the words hit the page, it’s a higgledy piggledy mess of well thought out, but very tangled ideas. 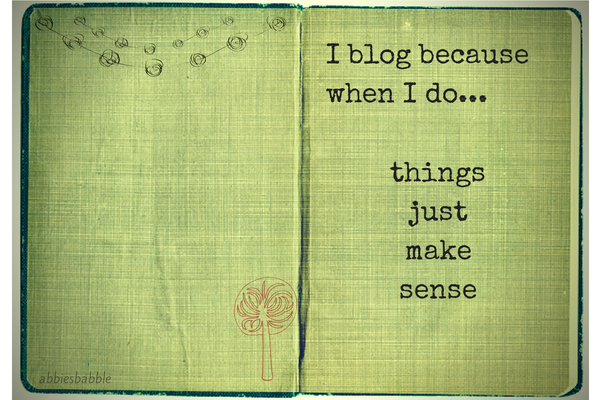 So yes, for me, writing, in this case blogging, is a great way to sort through some things. That was what I expected when I started, and it has most definitely been true. I am most articulate, when I have time to let my words be written. huge upside of blogging that I wasn’t expecting was connecting with other bloggers. I admit I was cynical and thought perhaps if anyone actually found my blog (I was prepared for the stats to sit at zero), they would criticize my writing or point of view. How wrong was I?! The blogging community is fully supportive. I’m not out there writing controversial pieces, I’m genuine and enjoying meeting like-minded people from all over the world. I am learning from and being inspired by other bloggers daily and who knows, maybe I can inspire someone else too?! Blogging has very quickly become a big deal for me. It’s not only a journal, but a hobby, a creative outlet (that I didn’t realise how much I craved) and a social channel too (for my introverted self it totally works!). There are all sorts of ‘rules’ of blogging but honestly, I’ve set out to be true to myself and that’s what I will keep doing. I’m not scared to share what’s on my heart – I am my experiences. I haven’t set out to make money, influence people, seek fame or anything else. I’m here to enjoy myself and write whatever comes out on the day. I agree wholeheartedly about the support one receives from the blogging community. It’s been an invaluable experience for me. That is the exact same reason why I began my blog, to find my own authentic voice. It’s a great outlet for me to make sense of experiences in my life and sort things out in my head. Art has been that for me and has also become a big deal. I started my blog as a way of journalling along side that. There’s a sense of trueness, sincerity & spirit. I sense the blossoming in you… That’s real and that’s beautiful… To witness a soul surfacing. That’s the sense I get from you. Hi Erik.. I’m with Abbie.. I can see by your blog you’re on your way… Wherever that may take you, but like us.. You’ve honored the whispering of your heart. Reblogged this on Fall in Love with Writing.